Chuck Reilly, Dacon; John Bradshaw, Dacon; and Jenna Connors, Expeditors. 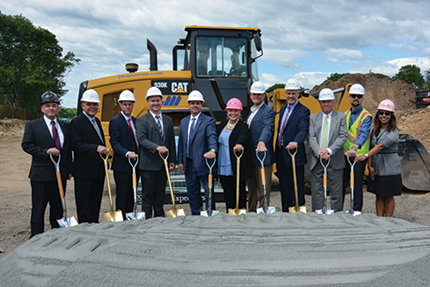 Peabody, MA Dacon Corp. and the Lucey Development Group joined Expeditors International of Washington, Inc., a leading provider of global logistics solutions, at a recent groundbreaking ceremony to celebrate the commencement of construction of Expeditors’ new office and warehouse project on Jubilee Dr. in Centennial Park. 795 Jubilee Dr. is a development project of the Lucey family. The Lucey Development Group has been developing property in Peabody for over 20 years including the current home of Expeditors’ Boston district office at 3 Technology Dr. This is the fifth project on the North Shore that Dacon and the Lucey family have collaborated on, all of which have been design/build projects. “In looking at construction options we find that design/build offers advantages in time and cost efficiencies. The collaboration and due diligence aspects inherent to design/build often reduce common pain points associated with development,” said Kevin Lucey, managing partner, Lucey Development Group. “With similar goals and work styles collaborating with the Lucey family for the last 20 years has been a pleasure,” said Chuck Reilly, VP of business development at Dacon. Dacon has designed and constructed over a dozen projects in Centennial Park. Civil engineer for the project is Meridian Associates, Inc. and the geotechnical engineer is McArdle Gannon Associates, Inc. The building is located on a 12-acre site serviced by existing utilities in Centennial Park. Areas of the building include a warehouse area of 104,354 s/f, an office warehouse area of 4,153 s/f, a first floor office area of 16,395 s/f and a mezzanine office area of 15,801 s/f for a total of 140,703 s/f. The building is a conventional steel structure with metal roof deck, a TPO membrane roof, a C11 infrastructure concrete slab, an insulated vertical metal panel façade on three sides and a glass and EIFS façade at the front corporate entrance. MEP systems include an ESFR sprinkler system, LED lighting throughout, gas heat in the warehouse with 100% HVAC in the corporate office. The fully landscaped site package has 184 car parking and the facility will be serviced by 19 dock positions. Ground was broken in late June with occupancy anticipated for spring 2019. Expeditors’ Boston district office has over 250 global locations with the Centennial Park location since 1997. The company employs 150 professionals at this location of which 60 reside on the North Shore. A global logistics company headquartered in Seattle, Washington. Expeditors employs professionals in 177 district offices and numerous locations on six continents linked by a seamless global network via an integrated information management system. Services include the consolidation or forwarding of air and ocean freight, customs brokerage, vendor consolidation, cargo insurance, time-definite transportation, order management, warehousing /distribution and customized logistics solutions. Dacon is a fully-integrated design/build firm that provides single-source solutions to clients’ most challenging facility requirements. Since 1985, Dacon has designed and built more than 26 million s/f, with a total value in excess of one billion dollars. Dacon’s clients span office, medical/life science, manufacturing, warehouse/distribution, cold storage, sports and academic facilities. With focused expertise in design/build, the goal of each project is creating efficient facilities resulting in optimal work environments that contribute to building successful client businesses.